The newest episode of the new year has me excited for what's to come! With the episode's name Blood Bond, we know it will be filled with the recent kryptonian familial issues and drama that has been on going on Supergirl. We will also see other bonds between Kara and her friends, boss, acquaintances, family, and family. With a rating of about 4 out of 5, it's one of my favorite episodes thus far. At her day job, Kara's charade of trying to divert her boss's assumption that Kara is Supergirl is very entertaining. "We have to act really really normal!" "Is this what having a stroke looks like? Is she having a stroke?" The run around is adorable, but turns 'sad' when Cat forces Kara prove it absolutely one way or the other. Kara pleading her case to Ms. Grant was one of my favorite moment! Although, the ultimatum, honestly, was not because I felt like Supergirl finding out about J'onn J'onzz was like "OOO! Problem Solved!' It was too easy! I really liked seeing the dynamic between Wynn and James during side mission. The banter proves they are becoming good friends, but one always wonders with Wynn's background and Kara's crush. Also we are getting a good look at, who seems to be the real villain of the season, Maxwell Lord. I've only read one comic (80pg book of Countdown to Infinite Crisis) with him in it and what I gathered was he was a good guy, but then turn bad after some of them left the first Justice League. I'm still reading and learning, if you want to give me a 411 on Lord in the comments that would be awesome! I also really like the lab/door that was singled out. A nod to the New 52. I feel like General Lane is to Supergirl, what General Ling is to the Flash, but Supergirl has won over some of his top soldiers. It was a nice scene when the soldiers defied General Lane's command; though, maybe a little forced. Finally we end on the PMing between Cousins. It's sweet, and I don't know about anyone else, but those little scenes make me giddy. 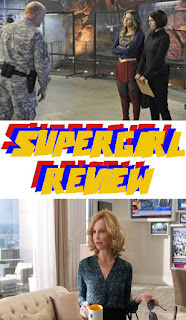 Supergirl is a cute, corny, giddy show that leave you with a smile on your face at the end of the day. I don't know about anyone else, but I'll be tuning one Jan. 18 for the next episode of Supergirl!